Just finished watching the first two episodes, and they left me laughing like crazy in front of my sleepy brother, who now thinks I’m a little bit crazy. 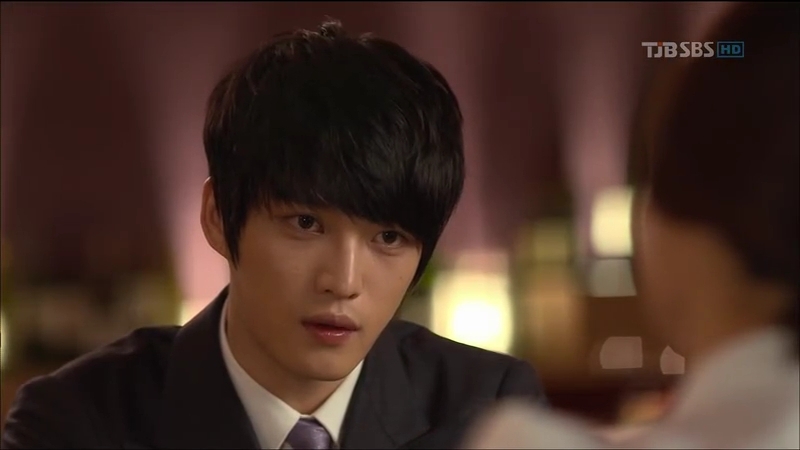 Waaa~ I didn’t expect Protect the Boss to be so quirky! Pardon me for being so ignorant like this =.=’ So, here’s another show added to my always-growing-and-never-ending list of dramas to be watched. It’s way better than what I expected before I started watching it. I never watched any dramas with Ji Sung (still waiting for my friend to download Royal Family for me) or Choi Kang-Hee in it, so I was completely oblivious to their way of acting. As for Wang Ji-Hye, who could forget her portrayal of In-Hee, the mighty bean pie in Personal Taste? So I reckon she’ll be able to carry out an elegant, sophisticated second female lead in this. And Jaejoong: although I’m a Cassie and have watched him in his Japanese debut drama Sunao ni Narenakute, I was still a bit nervous about people’s response about his first local role, so I planned to watch this later. Then, I read about the responses, which were good, and the ratings (wow, that’s pretty high! ), so off I went to download them, and ta-da! I’ve finished the first two episodes! There’s no subs, so I just picked up some of words that I could understand and tried to understand the whole lines. Although sometimes, I just had to laugh because their actions know how to speak louder than their words. Source of my laughter for most of the time: definitely Cha Ji-Heon (Ji Sung), who doesn’t have any hint of being a manager at a company, except for his attire, although the colors sometimes are a bit off. Any sight of his face and I’m ready to launch into a crackhead-like mode of laugh. He’s so childish, like a mischievous kid who always need to be chased out of his home to make him go to the school. The only difference is he goes to the company, but still carries a backpack around. With all the running and goofing around (and his expressions), he does have the qualifications to be an 8-year old kid, except that his size might be a little off. He’s always being hit or scolded (or worse, both) by his father, Chairman Cha, who always expect his son to be as capable as him to run DN Group. Ji-Heon, on the contrary, doesn’t even budge to do something to associate himself with the company except for coming to the company and leave every singe day. I should expect there’s something strange about him from his visit to the hospital to his awkwardness in front of a lot of people. He has some kind of fear to a lot of people looking at him, or sometimes, just be around him. Also, he’s a clean freak and hates to be in contact with people (so that explains the hand sanitizer that he needs practically all the time). And it turns out that he actually has obsessive-compulsive disorder (OCD).Poor Ji-Heon, so that’s why he doesn’t want his father to put high hopes for him and acts like he’s just a lazy bum. Sometimes, he does want to live up to his father’s expectation, and tries to do his best. Except that nothing is simple and easy to achieve. He must be hurting deep inside his heart as he has tried his best to do it, but the it’s not the time yet for him to shine. Not yet. My new favorite female character! Almost typical, but not quite the same, I think. Noh Eun-Sul (Choi Kang-Hee) might seem just like other KDramas female characters at first: bad tempered, not that rich, and loves money, but that’s not all of it. Why do I say that? Although she looks like a bad tempered woman, actually, she’s just another strong woman who can’t stand still while looking at injustice around her. Sometimes she just acts before thinking but she’ll have her own reasons. Heroic qualities? 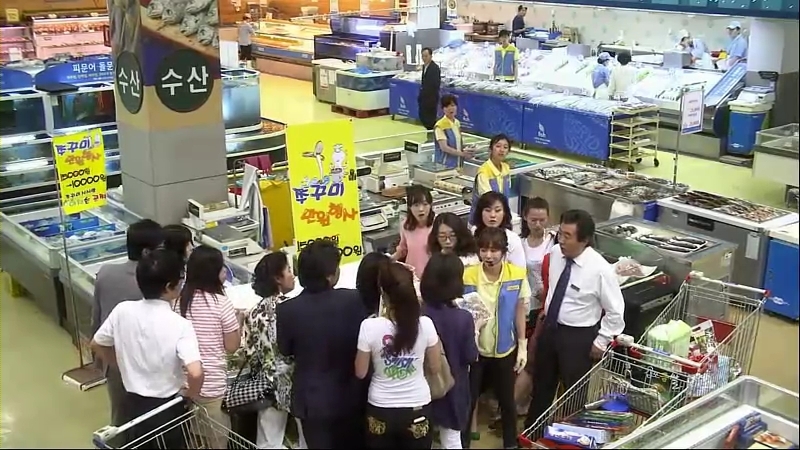 Eun-Sul is overflowing with it. Her endless energy, whether in fights or going for interviews, is amazing. Her uplifting spirit never fails to amaze me. My favorite scene of her is when she stood for herself during the interview with DN Group. Just because she is incomparable with other candidates, she gets ignored during the whole interview. After venting her dissatisfaction, she leaves with pride, while I’m cheering for her here. Her bravery doesn’t go into a waste at all; she gets offered a job as a secretary. And she ends up giving away the vegetables she is supposed to sell during her part-time job at a supermarket because she’s too dazed afterwards. I love her good self control and she knows well what will be if she just act recklessly, especially in the work that she really wants to keep. Maybe that’s a basic quality of secretaries: to be able to do all the instructions given by their bosses and doesn’t easily freak out when they’re bombarded with anger, orders, or just unpleasant actions. Also, I adore her friendship with her buddy Lee Myung-Ran (Ha Jae-Suk), which is as strong as her (or stronger? I’m not sure about this) and has become her friend since their schooldays. They remind me of Ra-Im and Ah-Young’s friendship in Secret Garden, and hopes that I’ll get to see more of their sister-like interaction. Also, I can’t wait to see Myung-Ran throws Ji-Heon on the floor when he tries to hit Eun-Sul. I’ m anticipating it very much. Add a boss with a childish attitude with a heroic secretary, guess what the result will be? A child-like boss, always under the good care his secretary/nanny/maid/bodyguard. Hee. I expected that Ji-Heon would remember Eun-Sul the moment he lies his eyes on her, but it turns out that he just remember her bun from their unpleasant first meeting, apart from her shoe that he takes into custody for the mean time. In the mean time, he just like to bug Eun-Sul while she’s trying hard to keep his head over her fists. Hee! I love these combo. It’s Eun-Sul who gets to be hero all the time, while Ji-Heon’s trial always ends in vain (cue the failed punching scene). Eun-Sul always saves Ji-Heon as he’s the one who is always in problem. Sometimes, she looks like a nanny to him, not quite a secretary. 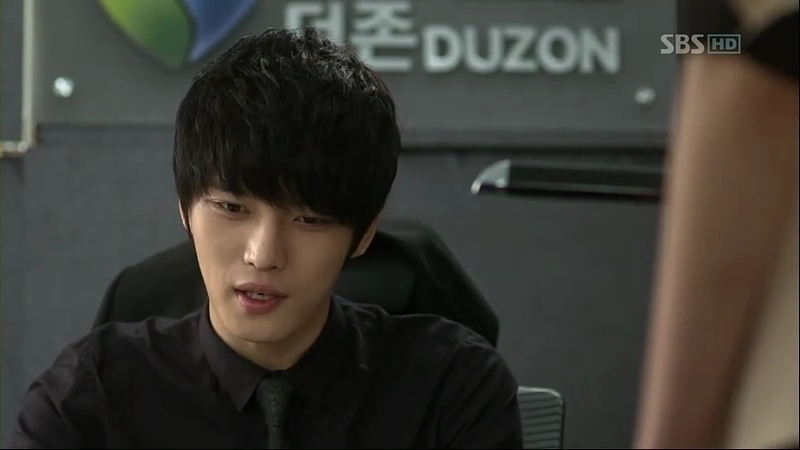 As for Ji-Heon, he’s not that skilled in fighting as her, but the authority that he has makes him as powerful as her. He’s truly like a child: he pities her and really wants to help her, but he doesn’t know what to do. ..and ends up being too far away from each other. Teeheehee. So, to other secretaries, beware of Ji-Heon rage when he’s on his back up mode. The person who he’s backing up? 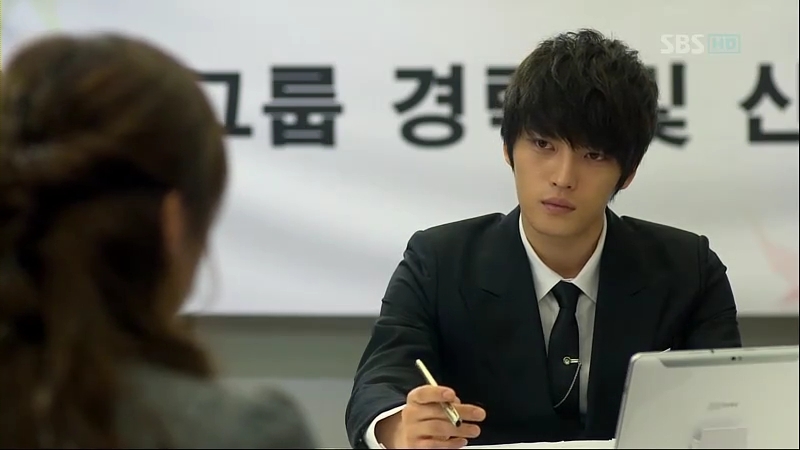 Of course his only secretary, Eun-Sul! The perfect people: those with good genes, basically good in everything they do. The complete opposite of Cha Ji-Heon: his perfect cousin, Cha Mu-Won. When I said they’re complete opposite, I really mean it. Mu-Won basically defines what an heir to a company should be: confident, sharp, intelligent, and may more good qualities, unlike Ji-Heon. Well, he’s prefect from top to toe, but his arrogant attitude makes me hate him..only a little bit. With his mother, who looks like she’s holding grudges towards Chairman Cha, he looks like someone who wants to take over the company from Ji-Heon, but who knows, there might be another back story coming later..
As for the time being, Mu-Won is just being shown as a kind manager and he looks like he cares about Ji-Heon, but let the time decides. He can be better, or worse. Hope that Mu-Won will be on the good side by not being a hindrance to Ji-Heon because I’ll hate myself to hate him. Seo Na-Yoon (Wang Ji-Hye) just appear two times: during the time when Ji-Heon gives up delivering the speech at the ceremony, and at the restaurant, dining with Mu-Won. She’s Ji-Heon’s ex-girlfriend and that keeps me wondering: what makes her broke up with him? And to conclude my rant, secretaries of Ji-Heon’s family members are doing bizarre tasks everyday, including..
and waking up your boss while accidentally discover him wearing a cartoon underwear. Next Post Team Ryu, Anyone?